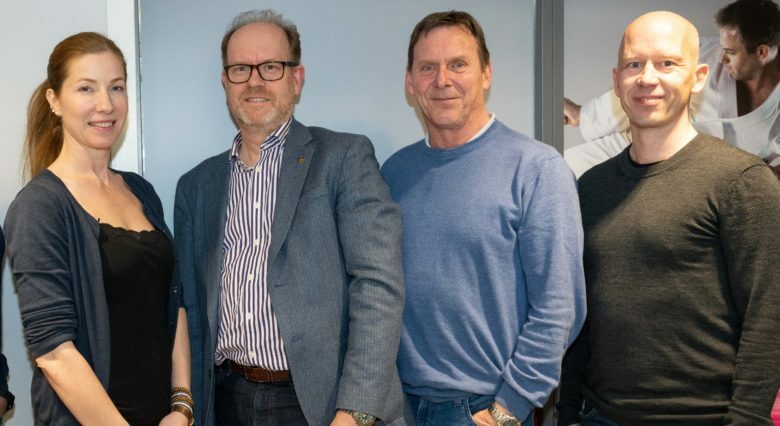 Her finner du regelverk for Shobu Ippon, samt Norges Kampsportforbunds felles stevnereglement. The goal of establishing these rules and regulations is to promote a fair and smooth course of occurrence of all events in any given tournament. 2. All tournaments in all countries shall abide by this present document. All participants shall act in accordance to the highest standards of ability and of fair play in the spirit of Karate Do and strive to the utmost respect and dignity towards others participants. If there arises a situation undefined by this present document, the decision shall be given by the Master Chief Judge. 1. Prior to holding a tournament, the Host Organization shall notify all concerned of its proposed plan for the upcoming tournament. 1. One Arbitrator shall be stationed at a Kumite Event. 3. An Arbitrator is responsible to provide appropriate guidance and decisions to the Head Judge and the Judges, timekeepers and scorekeepers in the following situation: the Arbitrator can interrupt a match by a sharp whistle blow to intervene if there is a breach of any of the Tournament Rules and Regulations or if the Head Coach has a protest or a question which makes it necessary to interrupt a match. 4. An Arbitrator is to only participate in a Judges’ conference in which disqualification (Hansoku) is being considered. 5. The Arbitrator is responsible for insuring that proper record keeping is done. 6. The Arbitrator can request any explanations deemed necessary from any officials. 7. The Arbitrator is selected and appointed to that position by the Master Chief Judge. 1. The Master Chief Judge is responsible to maintain a fair and smooth course of occurrence of all events in a given tournament. 4. After consultation with the Judges, the Master Chief Judge will decide the duration of disqualification and if it applies to further tournaments. A letter confirming this decision is then forwarded to the involved individual or group. 5. The Master Chief Judge is appointed by the Host Organization. If necessary, the Host Organization will also select an Assistant Chief Judge. 1. The Head Judge and the Judges are responsible for a match or event and make decisions during a given match or event. 2. The Head Judge and the Judges exert control over the surroundings of the match or event as well. 3. The Head Judge and the Judges are solely responsible for the outcome of a match of event and cannot be challenges with the exception of the Arbitrator. 4. The Head Judge coordinates the match or event and gives the final decision regarding the outcome of the match or event. 5. The Judges, previously called Corner Judges assist the Head Judge by indicating their own decisions during the match or event. 6. The Head Judge and the Judges are selected amongst the pool of certified Judges and appointed to their positions by the Host Organization. 1. If the competitors are qualified, the Host Organization cannot refuse their participation in a tournament. 1. One Head Coach can be present for his competitor during a match or event, whether individual or team event. 2. A Head Coach must be registered with the Host Organization prior to the tournament. 3. If a Head Coach has a question or protest regarding a match or event, it has to be addressed to the Arbitrator. No appeals can be done at the decision time (Hantei) now being called. 4. A Head Coach gives advice to the competitor from a designated area, with no disruptions or disturbances to other competitors or Judges during that match or event. 5. A Head Coach has to hold instructor’s qualification. A timekeeper is responsible to keep time of a match or event, as well as notify the Head Judge of elapsed time during the match or event as per set procedure. A scorekeeper is responsible for keeping a record of all scores during a match or event, as well as announcing or presenting those scores publicly. If necessary, the scorekeeper shall notify the Head Judge of these scores. A director of operations is responsible for good communication between all competitors and officials to ensure smooth occurrence of the tournament. 1. The Official Doctor is selected by the tournament officials. 2. The Official Doctor in conjunction with the Master Chief Judge, is responsible for all medical decisions that may occur during the course of an incident involving injury, whereas the candidate is to continue or withdraw from a match. A medical attendant is responsible to treat and support an illness or injury that may occur during the course of a tournament, in order to maintain a safe environment for all participants. 1. A competitor wears an all plain white karate uniform. 2. A competitor wears nothing more than is mentioned in the prior statement unless specified by either the Head Judge or the Master Chief Judge. 3. A Head Coach must wear an identifying item on a designated area. 4. The Head Judges, the Judges and the Arbitrators must wear official dress wear. An identifying item is worn on a designated area. 5. All other support staff is easily identified as such by wearing a similar dress wear. 1. The court area is a square measuring 8 meters X 8 meters, marked off by a 4-5 centimeters wide line. The outer edges of this line measure 8 meters. If mats are used, the boundary may be marked by mats of a different color. 2. For a Kumite Match or Event, the starting positions of the competitors are on the center line, indicated by two parallel lines both 1 meter long, and that are 3 meters apart from each other. In general, when facing what is called the Front or Shomen, the right line is red and the left line is white. 3. For a Flag System Kata Match or Event, the starting lines of the competitors are 2 meters from the back line and 3 meters apart from each other. These lines are designed in the shape of a short inverted T; the horizontal line is 70 centimeters long and the vertical line is 35 centimeters long. As for a Point System Kata Match or Event, the inverted T starting lines are 2 meters back from the center of the court. 4. For safety reasons, a court shall not be raised for more than 1 meter above the ground level and there is a 2 meters wide safety area around the court. 5. The surface of the court should be flat and smooth. It may be made of wood, resin, urethane mats or Tatami mats. 6. To indicate the position of the Head Judge, a line is drawn 1.5 meters back from the center of the Court. 2. It is possible to hold different events as well. a. 1 Point Match or Ippon Shobu: The competitor who has scored one full point or 2 half Points first, within the allotted time, is declared the winner. b. 3 Points Match or Sanbon Shobu: The competitor who has scored 2 full points first, within the allotted time, is declared the winner. 2. In a match or event, all techniques – punches, kicks, strikes, have to be done with control. The distance required to do the techniques should be close enough to be able to be effective. There should be no damage done to the opponent. A light touch to the target is permitted. 1. A team consists of an odd number of competitors. 2. As a general rule, all team members have to be present at the first round of a match or event. The team that is seeded or placed in order to not face each other in the first round, have to be present at the second round of a match or event. Subsequently, if the team is missing a member or members, that missed person or persons must be placed last in the sequencing of competitors of that match. 3. Prior to the event, the order in which the competitors will perform must be reported by the Head Coach or Team Leader. This must be done for each round of a match. 4. The winning team is determined by the number of individual performances that are won. 5. There are two kinds of team competition. The first one is when an equal amount of competitors from each team face each other, determining a number of wins. a. Match by Elimination: Each team member has one performing bout each. The individual results are then added up to determine which team has won. If there is a draw, the highest score determines the win, as per the following: 1 point or Ippon, disqualification or Hansoku, absolute disqualification or Shikkaku, withdrawal by disqualification or Kiken, out of bounds or Jogai Hansoku, volunteer non defending or Muboubi Hansoku, 2 half points, decision by Judges. b. If there is still a draw, a match is held with a competitor chosen by each team, in order to determine the win. This is called a Decision Match by Team Choice or Daihyosha Ketteisen. This match continues until there is a winner. In this case, a team member that has performed before may compete, but no more than twice. The second kind of team competition is when an equal amount of competitors from each team face each other, the winner of a match remains to fight each competitor of the opposing team in turn, until a loss. The competitor who loses a match is eliminated from this process. No mixed team of males and females are allowed. c. Round Robin Elimination Match: The winner of the first match stays in the court and keeps fighting until he loses. The loser steps out and the next team member steps in. When all members of the team have lost, the team itself loses. 3. If all the criteria mentioned above have been reached in the execution of either a punch, a kick or a strike, this constitute what is scored as 1 point or Ippon. 5. A technique that is well executed but does not qualify as a 1 point or Ippon, is defined as a half point or Waza-Ari. 6. 2 half points become 1 point or Ippon. 7. If both competitors move and execute a technique at the same time and with similar intensity, this is called Aiuchi. In this instance, the attacks cancel each other and no points are scored. 1. If none of the two competitors reach the full score within the allotted time, each Judge indicate their decision as to the outcome of the match or event. The outcome of the match or event is determined by the decision of all the Judges together. See Item 11 of the Tournament Rules & Regulations for Officials. The Head Judge will then decide the outcome of the match or event. 2. If both competitors get injured or for other reasons cannot continue the match, the Judges will indicate their decision as to the outcome of the match or event. The Head Judge will then decide the outcome of the match or event. 4. The Judges must carefully take into consideration all the elements if a competitor who has a half-point orWaza-Ari , as well as has more than one warning that are of different categories of warning. If the outcome of the match or event cannot be decided, a draw or Hikiwake is then declared. The Host Organization decides prior to the Tournament if there should be a “sudden death” match within a second re-match situation. 1. If there is a draw, another match will be held. This re-match is called Sai-Shiai. If this re-match ends up in a draw, a second re-match called Sai-Sai-Shiai will be held. However, the Head Judge may order that this second re-match is a “sudden death” match meaning that the competitor that scores first is declared the winner. 2. After a second re-match the Judges must determine a winner. 3. In a World Championships as well as a National Championships, the final match of that event will have as many re-matches as needed in order to determine a winner. a. If an element has been identified but not severe as to cause injury or damage to a competitor, a caution or Keikoku is then given. This caution does not affect judging decision but if a second caution is given, called warning or Hansoku Chui, in the same match, this could result in disqualification (Hansoku) of the perpetrator and the other competitor is declared the winner. b. If an element has been identified as severe and there is obvious malicious intent or if a competitor is seriously injured or damaged, a warning (Hansoku Chui ) or a disqualification (Hansoku ) can be given to the perpetrator and the other competitor is declared the winner. 3. Any competitor who has received a disqualification or Hansoku twice during a tournament, is not allowed to continue to compete in Individual or Team Kumite. However, participation in Kata Events is possible. The competitor who has received a first disqualification or Hansoku is to be identified by the marking of a red tape, placed on the upper arm on one side. 4. When a Hansoku is announced by the Head Judge, the scorekeeper will record this on a specific document that is submitted to the Master Chief Judge. If a competitor touches the ground outside the borders of the court with any part of the body, a caution indicative of out of bounds or Jogai Keikoku is then announced. If this happens a second time, an out of bounds warning or Jogai Chui is given. If this happens a third time, a disqualification by out of bounds or Jogai Hansoku is given to the perpetrator and the other competitor is declared the winner. If a competitor scored before being out of bounds, his score will prevail. 2. Although not necessarily hit, a competitor can receive a non defending reprimand, either caution, warning or disqualification as the referee may judge the present situation dangerous. In that case the other competitor is declared the winner. c. if it is deemed inappropriate for the match to continue An absolute disqualification or Shikkaku can be given without any prior warnings and to any person within the tournament site. 2. After absolute disqualification has been given to a competitor, that competitor cannot continue to participate in that tournament, whether Kumite or Kata. 3. The details of an absolute disqualification must be discussed by the involved Judges and given to the pertinent scorekeepers who enter these specified details on the appropriate form which is given to the Master Chief Judge. 4. If a team has perpetrated a serious offense, the whole team is given an absolute disqualification and the other team is declared the winner. 5. An absolute disqualification also can be given in a Kata match or event. 2. If a competitor or team withdraws, the other competitor or team is declared the winner. 3. A competitor who voluntarily withdraws with no obvious physical reasons, cannot compete in any other matches or events. 4. Withdrawal or Kiken also can be given in a Kata match or event. 1. If a competitor is injured, the Head Judge will consult with the doctor and will await a diagnosis of the injury. The match is thus stopped until the doctor has finished the care of the injured competitor. If a competitor in unable to continue a match due to that injury, the Judges will decide if a withdrawal or Kiken is to be given. If that is the case, without calling a disqualification or Hansoku, then the other competitor is declared the winner. If both competitors are injured and there are no disqualifications or Hansoku issued, then the match is stopped and a decision as to the outcome of the match will be called. 2. If a competitor is unable to continue a match due to an injury, then a withdrawal or Kiken will be given and the other competitor has been issued a disqualification or Hansoku, the injured competitor is declared the winner. This decision prevails even if the disqualified competitor has scored a half point or Waza-Ari. 3. In case of an injury, the doctor will discuss the injury with the Master Chief Judge and can request that the injured or incapacitated competitor withdraw from Kumite events. That competitor could participate in Kata events at the doctor’s recommendation. 1. The allotted time for a match or event is 2 minutes. At a World Championships or National Championships, the adult male final Kumite match is 5 minutes. However, the Host Organization can decide otherwise. 2. The Head Judge starts the match with a verbal cue that ends with the word: begin or Hajime at which time the countdown is started. Countdown is interrupted when stop (Yame) or out of bounds (Jogai) is called. Countdown resumes when the verbal cue: resume or Tsuzukete Hajime is pronounced. If the allotted time for the match has elapsed, the timekeeper will announce this to the Head Judge and the match is thus finished. a. Red and White Flag System: 2 competitors simultaneously perform the same Kata that is chosen by the Head Judge and a winner is declared. The competitors must clearly repeat back to the Head Judge the name of the chosen Kata. The Head Judge will acknowledge this and the match or event begins. b. Point System: 1 competitor at a time perform a Kata and each Judge gives points on the performance of that competitor. The points are added up for a total score and a winner is declared. c. Team Kata: 3 competitors perform the same Kata and start by facing the Front or Shomen, at a starting position of their choice. The team is given a total score according to the Point System. The 3 competitors have a choice to form a triangle or a reversed triangle. A competitor on reserve may be substituted at any match but must be registered as a participant prior to the start of the tournament. 2. Each competitor or team chooses a Kata from the following list that has been approved by the Masters Committee or Shihan-Kai: Heian Shodan . Heian Nidan . Heian Sandan . Heian Yondan, Heian Godan . Tekki Shodan . Tekki Nidan . Tekki Sandan, Bassai Dai . Kanku Dai . Enpi, Jion . Jitte, Hangetsu, Gankaku, Bassai Sho, Kanku Sho, Chinte, Unsu, Meikyo, Wankan, Sochin, Nijushiho, Gojushiho Dai, Gojushiho Sho. d. d) Match by Favorite Kata or Tokui Kata – The competitor chooses a Kata from the list as seen in the above #2 with exception of all the Kata in the Designated Basic Kata list, and the winner is declared by point system. 2. For Point System, 10 is the highest score. The Master Chief Judge decides what the average or median score will be. The Judges and the Head Judge decide and indicate their scores on their respective score boards. The highest and the lowest scores are dropped and the rest is added up, forming the total score. e. the competitor is outside the 1 step allowance for coming back to the starting position (Embusen). This can represent 0.1 to 0.3 deduction in scoring. 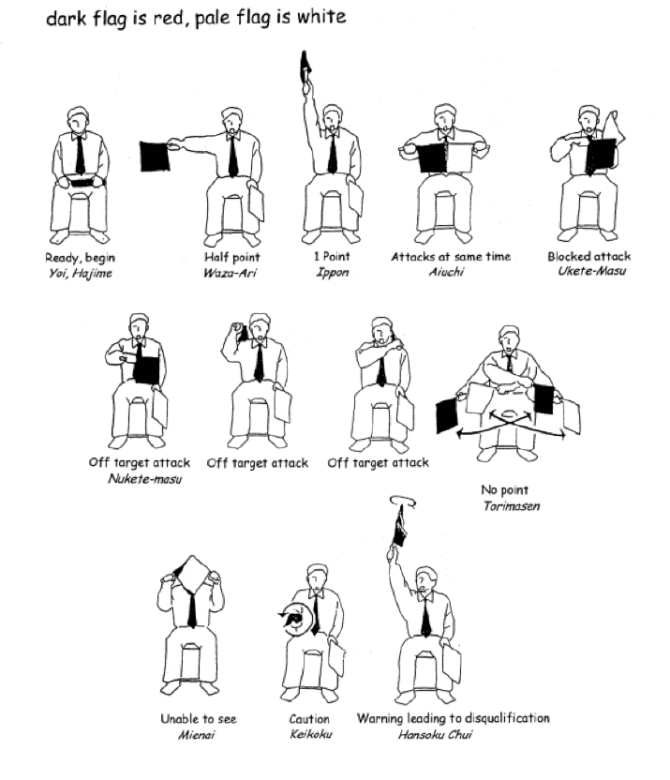 f. In Team Kata, at anytime, verbal or non verbal cues to encourage synchronization are subject to deduction. 1. 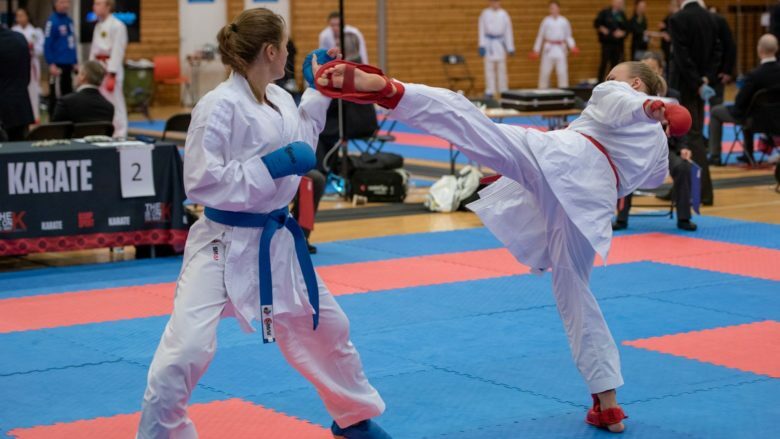 If there is a draw in a Red and White Flag System match or event, the Head Judge will choose another Kata to be performed by the 2 competitors. This is called re-match or Sai-Shiai. The outcome of this re-match must be decided. 2. If there is a draw in a Point System match or event, the competitors will perform the same Kata again. This is called re-match or Sai-Shiai. If there is still a draw, the lowest score that was dropped is now added up for a total score. If there is still a draw, the highest score that was dropped is now added up as well for a total score. If finally there is still a draw, the competitors will perform a different Kata. This is now called second re-match or Sai-Sai-Shiai. The outcome of this second re-match must be decided by different scoring points by each Judge. c. The Host Organization may make variations of the divisions. 2. Adult Females are considered so after high school graduation. The Host Organization may decide on variations of the divisions. This tournament is to follow the Tournament Rules & Regulations guidelines. The Host Organization may make varying decisions regarding these tournaments. The revision of this document is done by the Masters Committee also called Shihan-Kai with a majority of two thirds of the members present. 1. The goal of establishing these rules and regulations for officials is to promote standardized guidelines to ensure a fairness and smoothness flow in decisionmaking. 2. This document is to be used as a supplement to the Tournament Rules & Regulations document. All official tournaments sponsored by The Japan Karate Association are to follow these rules and regulations. 1. All judging officials are to be neutral and fair. 2. All judging officials should make their decisions freely and based on the Tournament Rules & Regulations documents. 3. All judging officials are to behave in a dignified and professional manner. 4. All judging officials give their decisions promptly and accurately. 1. The Head Judge calls the competitors to line up. Then to bow to the Front or Shomen Ni Rei and to each other or Otagai Ni Rei. 2. Two competitors move to their respective designated positions and bow to each other. 3. At the end of the match or event, the Head Judge calls the competitors to line up, then will tell them to bow to each other and to the Front. 5. 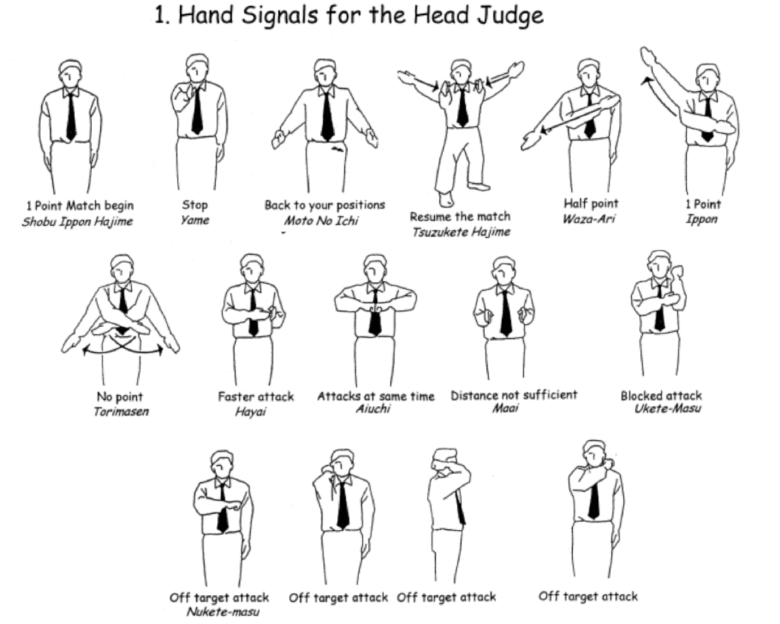 During the match or event if any of the above is identified, the Judges will signal the identified element by whistle and a corresponding flag gesture to the Head Judge. 7. The Head Judge then gives the command to resume the match or Tsuzukete Hajime and the match is thus pursued. 8. A competitor may request to have the match interrupted by calling a time-out for the following situations that may not have been noticed by the Head Judge: accident, injury or sickness. However, the match is not interrupted until the Head Judge chooses to call the interruption, saying stop or Yame. 10. When it is time to decide the outcome of the match or event, the Head Judge will use either voice command or whistle command to indicate that it is decision time or Hantei. The Judges will then indicate their decision by using a flag or flags. 11. After taking notice of the decision of each of the Judges, the Head Judge will indicate by whistle to the Judges to lower their flag or flags and then announces the outcome of the match or event. The Head Judge will use step 9 and 10 in the occurrence that all allotted time has elapsed. 12. The timekeeper is seated at a designated location and monitors with a stopwatch the elapsing time during a match and uses a bell to indicate to the Judges by ringing once and announcing that 30 seconds are remaining, as well as by ringing twice, and announcing that all allotted time has elapsed. The announcement of this always prevails. 13. The scorekeepers use the pertinent official forms to keep records of all scores and outcome of all matches or events, following the Head Judge’s announcements. 3. For a Red and White Flag System match or event, both competitors before entering their designated positions in the court, bow to the Front or Shomen, then each competitor moves to their respective starting positions and bow to each other or Otagai Ni Rei. The Head Judge then chooses at random a Kata and announces the name of the Kata to the competitors. The red side repeats the name of that Kata first then the white side does the same. The Head Judge will confirm the name of the Kata, and creates a pause. Both competitors will then begin their performance at the Head Judge’s command to start either by using the voice command “ready.. start” (Yoi.. Hajime) or by whistle. For Designated Basic Kata or Shitei Kata, the Head Judge chooses at random a Kata from the set of Designated Basic Kata cards then announces the name of that Kata to the 2 competitors. The red side repeats the name of that kata first then the white side does the same. The 2 competitors begin at the Head Judge’s voice or whistle command to start. 4. For Point System match or event, for either Designated Intermediate Kata (Sentei Kata ) or Favorite Kata (Tokui Kata), the competitor before entering the Kata designated starting point in the court, bows to the Front or Shomen, then moves to the Kata starting position, and announces the name of the chosen Kata, in a loud and clear voice. The Head Judge will repeat the name of that Kata and the competitor will then start their performance at their own timing. In Team Kata, only 1 of the team competitors announces the Kata. The scorekeepers use the pertinent official forms to keep records of all the names of the Kata chosen by each competitor. 5. For a Red and White Flag System, when the performance is finished, the competitors return to the starting position following a voice command from the Head Judge to recover or Naore, and wait for the decision of all the Judges. After the final decision is announced, both competitors bow to each other or Otagai Ni Rei, exit the court, then bow to the Front or Shomen. For Point System match or event, after the final decision, the competitor bows to the Front, exits the court, and bows to the Front again. Team Kata competitors follow this procedure as well. 7. If any of the above have been identified, the Judges will indicate it to the Head Judge by whistle command. 8. For a Red and White Flag System, when it is time to decide the outcome of the match or event, the Head Judge will use either voice command or whistle command to indicate that it is decision time or Hantei. The Judges will then indicate their decision by using a flag or flags. For Point System match or event, when it is time to decide the outcome of the match or event, the Head Judge will use whistle command to indicate that it is decision time orHantei. The Judges will then raise their score boards or score cards with their choice of score. One of the scorekeepers reads in a loud and clear voice, each score, starting from the Head Judge and moving clockwise. The other scorekeepers write the announced scores on the appropriate official forms, make the necessary calculations for a total score. A scorekeeper will announce the final score to the Head Judge, in a loud and and clear voice and the Head Judge repeats this score to the competitors. The Head Judge will then use whistle command to indicate to the Judges to lower their score boards or score Cards. 3. If a competitor scores with consecutive techniques called Renzoku Waza, the Head Judge announces the target area and the kind of attack as well as announces either a half point by consecutive techniques or Renzoku Waza Waza-Ari, or a 1 point by consecutive techniques or Renzoku Waza Ippon given. 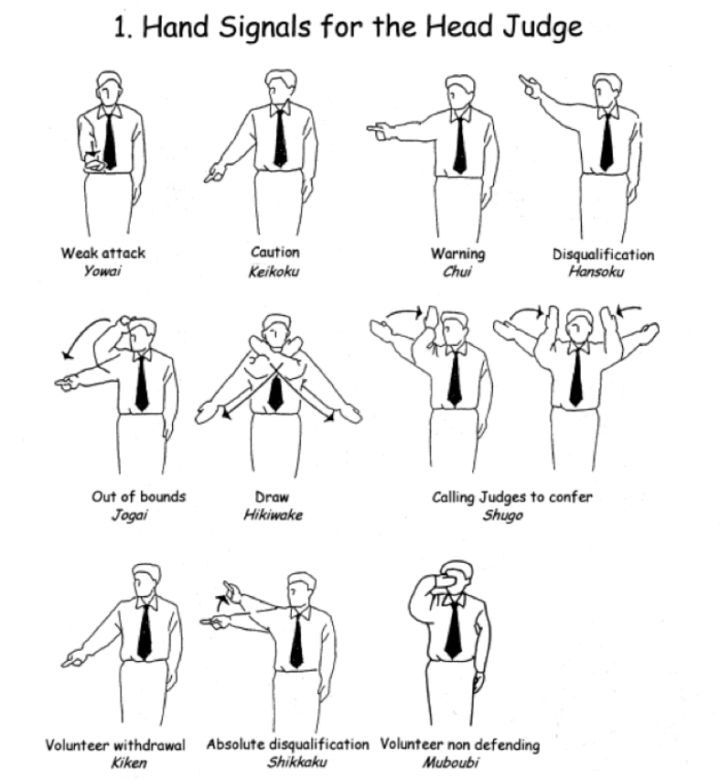 The Judges use specific gestures when expressing their judgments and decisions. See Appendix 6 for illustrated table. 1. 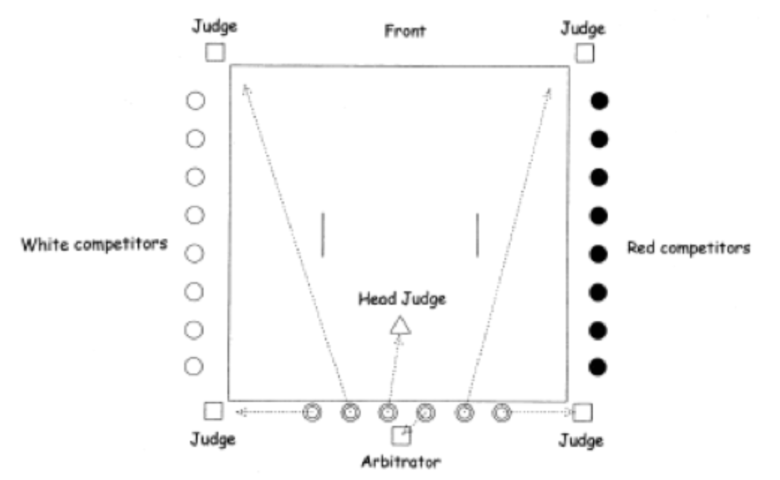 The Head Judge during a match or event is positioned as seen below and moves according to the competitors. 2. The Judges hold a whistle in their mouth and a red and white flag in each hand. They are positioned as seen below. Note: For a Red and White Flag System, please see above diagram. The red competitors are situated at the right side of the Head Judge while the white competitors area at the left side. For the Head Judge and the Judges, please follow the Arrows to see where the competitors are positioned after initial bowing and when the match or event is over, to see them come back to their original positions for the final bowing. The Arbitrator sits facing the Front or Shomen, for observation of the match or event. The Head Judge decides the outcome of the match following the indications of all the Judges. Please see the table below for all possible decisions in a Red and White Flag System both for Kumite or Kata Events. 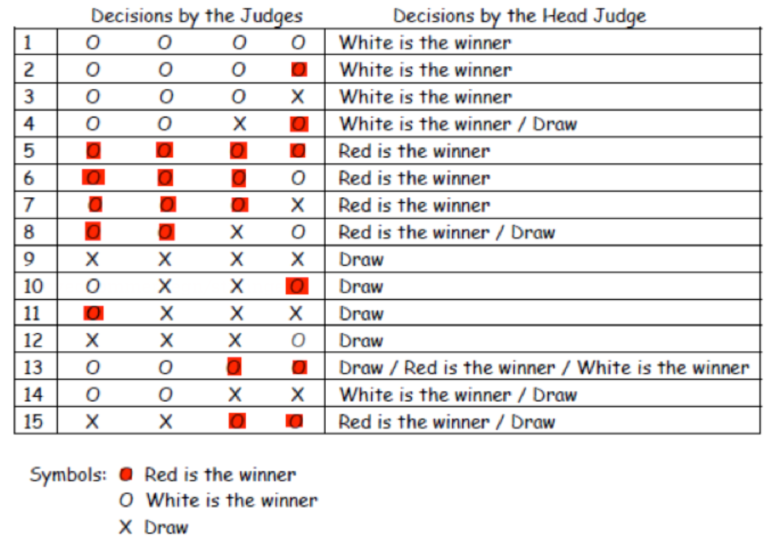 Please see the diagrams below for the location of the Head Judge and the Judges as part of a Red and White Flag System as seen on the left hand side and a Point system as seen on the right hand side. For the Head Judge and the Judges, please follow the arrows to see where they are positioned after initial bowing and after the match or event is over, to see them come back to their original positions for the final bowing. The Arbitrator sits facing the Front or Shomen, for observation of the match of event. Regarding the rules and regulations that concern these tournaments, please refer to the previous document. 1. When called, the 2 selected competitors move forward to their designated starting positions and bow to each other. 2. The Head Judge starts the match with the vocal command: begin or Hajime. Note: Red side always starts first. Then, the attacks alternate between each side. 1. Punch to the face or Jodan Oi-Zuki – aiming for either just below the nose and in this particular situation, as well for the lower part of the chin. 2. Punch to the stomach or Chudan Oi-Zuki – aiming for the solar plexus. 3. Front kick to the stomach or Chudan Mae-Geri – using the back leg, aiming for the solar plexus. Note: The above techniques are done with the right hand and the right foot. If there is a draw, the above techniques are repeated but with the left hand and the left foot. 4. There must be appropriate distance to attack. The attacking competitor steps the leg back and forms a downward block or Gedan-Barai. Each attack must be clearly announced before execution. Note: For the execution of front kick or Mae-Geri, both arms are extended and kept on each side of the body. 5. After the completion or an attack and defense sequence, both competitors simultaneously return to the natural position or Shizentai. The attacking competitor takes a step back to Return to the natural position while the defending competitor takes a step forward to do the same. Note: If the distance between the competitors is not appropriate, the Head Judge or the Judges will tell the competitors to adjust their distance appropriately. 1. Any kind of blocking techniques and body shifting can be used. 2. Any kind of counterattack to the target areas as mentioned above, can be used but only a single counterattack is allowed. 1. An attack or defense technique can only be used one time. 2. There is to be one sudden vocal release of energy or Kiai per attack and per counterattack. 1. The outcome of the match or event is decided by the Head Judge and 4 Judges. 2. If there is a draw, the same attacks are done with the left side initiating the attacks. Following this, a decision to declare a winner must be reached. 1. Faking a movement in order to have the opponent move, and then attack that opponent. 2. Lunging the body towards the opponent or taking more than one basic step forward to attack. 3. From the natural position or Shizentai, the attack must follow a straight line forward and not follow the opponent who may have moved prior to completion of the attack. Attention: The foot of the attacking competitor that has stepped forward, should end up positioned between the opponent’s legs. Fundamental basic technique must be applied during execution. 4. Face level and stomach level attacks that are executed with forceful motions such as pressing the arm downward while the opponent is executing a blocking technique. 5. Withdrawing too quickly the hand that is executing an attack. 1. Contact or hitting the attacking competitor other than the blocking technique that should be executed. Attention: There is no contact to the other competitor except to execute the blocking technique. 2. Any combination techniques; sweeping the attacking competitor – Ashi-Barai; any projection techniques or holds involving the joints. 3. During the execution of a blocking technique to the stomach, to be blocking at the other competitor’s elbow. Attention: Proper blocking is done at the wrist of the attacking competitor. 4. During the execution of a blocking technique to the face, any forceful motions that may cause a loss of balance of the attacking competitor. 5. During the execution of a blocking technique to the stomach, to be using any forceful downward motions. 6. Withdrawing too quickly the hand that is executing a counterattack. 1. When a prohibited element has been identified, the Head Judge and the Judges will confer and indicate their decision regarding the degree of severity and give the appropriate reprimand, either a caution or Keikoku, a warning or Chui, a disqualification or Hansoku, and pronounce absolute disqualification or Shikkaku. 2. Please refer to the section Criteria Leading to Disqualification (HANSOKU) as part of the Tournament Rules & Regulations document for additional information. 2. The Head Judge starts the match with the vocal command: begin or Hajime. As both competitors step forward in their ready to fight positions or Kamae, the red side always starts first. After each attack, block and counterattack sequence is completed, the competitors pause in ready to fight positions or Kamae at a proper distance or Maai, then return to their starting points, still in ready to fight positions or Kamae. The 2 competitors then wait for the Head Judge’s command to resume fighting, either the red side or the white side initiating. 3. The competitors may choose their ready to fight positions or Kamae. However it is recommended that in a Junior Tournament the competitors hold their arms in front of their body. 4. After all attacks are executed from both sides, the competitors return to their designated starting positions and wait for decision of the Judges. 5. Both competitors must wear guards for the hands as per the Tournament Rules & Regulations document. 4. There must be appropriate distance to attack and each attack must be clearly announced before execution. 3. When there is proper distance or Maai to attack, the competitor must initiate that attack. It has been seen that proper distance or Maai has been reached and no attack is initiated. This must not be done. 4. The defending competitor must not back away creating a longer distance from the attacking competitor. 5. Faking a movement or Kensei is not allowed. 1. Distance is too short, and lunging the body towards the opponent. 2. Withdrawing too quickly the hand that is executing an attack. 3. Contact or hitting the opponent. 4. Blocking or shifting the body during the counterattack. 5. Grabbing or holding the opponent. 1. Stepping out of the court for 3 times. A caution or Keikoku is given for the first time, a warning or Chui is given for the second time and a disqualification or Hansoku is given for the third time. 2. Blocking and counterattacking at the same time. Note: Please refer to the section Criteria leading to Disqualification (HANSOKU) as part of the Tournament Rules & Regulations document for additional information. 1. Proper distance and angle of the techniques towards the target area. 2. Proper timing when blocking and if the attacks are properly blocked at the wrist and ankle of the opponent as well as the attack being properly diverted and the body moved from the line of attack. 3. If the blocking technique is practical and body shifting is done according to the opponent. 4. Proper choice of counterattack from the defending position and according to distance and the rapidity of execution of this element. 5. Motionless of supporting leg when initiating a blocking or attacking sequence. 1. Degree of use of the body to generate this focus of power. 2. Hip rotation and feet movement are smooth and proper direction of body and techniques. 3. Proper stance and posture and the degree of transforming the body parts into “weapons” of attack and defense. 4. Proper sudden vocal release of energy or Kiai, spirit and power as a unit. 1. Free fighting (Jiyu Kumite) can be done from Elementary school level, 9 years old and up. 2. Tournament Rules & Regulations as per previous document is to be followed or as decided by the Host Organization. 3. Boys and girls are not permitted to participate together in Team Events. 4. Large age gaps between young and older competitors are not permitted. 5. During all Kumite matches or events, touching the face area or Jodan is not permitted. 6. Criteria of decision regarding techniques is based essentially on safety as well as timing and distance. 7. During all Kumite matches, delivering a kick to a competitor who is on the ground is not permitted. 8. Boys and girls are required to wear a transparent mouth guard, gloves and a chest protector. The competitor who finishes the Kata earlier than the other, must wait until the Head Judge indicates the competitors to recover or Naore. 2. Boys and girls are not permitted to participate together in Team Events. 3. Large age gaps between young and older competitors are not permitted. 4. For all other pertinent items, please refer to the Tournament Rules & Regulations.